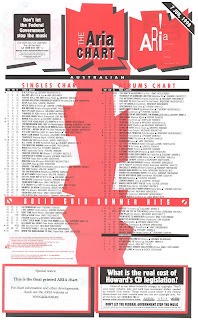 We're halfway through our look back at the final ever* ARIA top 50 printout. (*until they changed their minds a few months later). See, here it is below. So let's continue our countdown with numbers 25 to 1, with the chart-topping single just happening to be the worst single by one of my favourite pop acts of all time. With a name like Cleopatra Madonna Higgins, the lead singer of this trio of sisters was always going to be famous - and for a brief time she and siblings Yonah and Zainam were thanks to perky pop/R&B tunes like this debut single. Number 24 "Twisted (Excuse Me)" by Wayne G featuring Stewart Who? It was pretty unusual for a club record as dark as this to become such an enduring hit, but this trance track by the British DJ/producer spent almost half a year in the top 50. Probably had something to do with its F-bomb-featuring lyrics and risque music video. They'd been having hits in the UK for a couple of years with their radio-friendly pop/soul, but this future chart-topper from second album Postcards From Heaven was the first single by duo Lighthouse Family to crack the Australia market. And crack it "High" did, spending a mammoth 17 weeks in the top and ending 1998 as the year's 11th biggest seller. I'm kind of suprised this single from the US college rock trio constitutes the only top 50 appearance by one-time honorary Australian Ben Folds, whether as part of this band or solo. One thing I didn't know until now: "Brick" is about an abortion Ben's high school girlfriend had. We saw the follow-up in Part 1, and here is Usher's breakthrough single, which reached number 2 in the US and topped the UK chart. "You Make Me Wanna..." was not Mr Raymond's first single, however - he'd been releasing music since 1993. Early 1998 was peak Backstreet Boys, with the best boy band of all time achieving a hat trick of top 5 hits, of which "All I Have To Give" was the third. They'd even reach the top 10 later in the year with a dreary ballad from 1995 that had originally appeared on their debut album. BSB were so big at this point that even this woeful cover of The Jets' US and UK top 5 hit by Nick Carter's 10-year-old brother made it into the top 10. And yes, it's still as painful to listen to as it was in 1998. From the ridiculous to the sublime, trip hop pioneers Massive Attack finally landed a long overdue hit with this pristine piece featuring the haunting vocals of Cocteau Twins' Elizabeth Fraser. From 2004, "Teardrop" was used as the theme to medical drama House. Since 1995, Tina Arena's singles had followed the pattern of big hit, not-so-big hit, big hit, not-so-big hit, and so after "If I Didn't Love You" just missed the top 40, this flamenco-tinged third release from Don't Ask performed as expected. The second highest-selling of 1998 had been in the top 20 since the very start of the year, and as well as topping the chart for a week in March, had spent six weeks at number 2. The remix of the hip-hop trio's debut single from 1983 would amass 37 weeks in the top 50 and sell millions of copies around the world. It'd been a while between hits for our next hip-hop act, who achieved their biggest single since 1991's "Set Adrift On Memory Bliss" with this track, which sampled Imagination's "Just An Illusion" and featured Bob Marley's son Ky-Mani. "Gotta Be... Movin' On Up" would end up being the duo's final top 50 appearance. The chart history of this mega-ballad was everything that was wrong with the music industry in 1998. Multiple versions of "My Heart Will Go On" were released and deleted over the course of the first half of the year - the original single, the "Valentine's version" (with a different range of bonus tracks) and the club mixes. But despite these being quite distinct releases, all of them contributed the one chart run for the song, which at one point saw the "single" progress 1-24-64-59-35-10-3. Ridiculous. They'd been around since ska was last big (as 2 tone) in the early '80s, but it wasn't until this lead single from fifth album Let's Face It that Boston's The Mighty Mighty Bosstones (briefly) reached a mainstream audience. Number 12 "Fight For Your Right (To Party)" by N.Y.C.C. The original version had given Beastie Boys their first (and, until July 1998, only) hit in Australia in 1987, just making the ARIA top 40. This cover by German DJ/producer Sören Schnakenberg was presumably inspired by the success of the Run-DMC remix, but came off sounding like the cynical cash-in it clearly was. Here's another single that received the Celine Dion treatment. At this point in its chart run, the CD single of Ricky Martin's breakthrough Spanglish hit consisted solely of versions of "Maria" and had been bobbing around the top 20 since March. But teamed with the recently released World Cup theme, "The Cup Of Life", it jumped from here to number 1 in two weeks and stayed there for six. Then, as it started to drop down the top 10, it was deleted and sped out of the top 50. One-hit wonder time. Alternative rock band Marcy Playground reached the same position in Australia and the US with this song, which got its title from something once said to singer John Wozniak when he was in his girlfriend's college dorm room. Hanson are often wrongly described as a one-hit wonder thanks to the overwhelming success of "MmmBop", but this fifth and final single from Middle Of Nowhere was the trio's fourth (of five) top 10 hits in Australia. Its stay in the top 50 was limited to a brief seven-week run, dropping like a stone in the subsequent weeks. Enjoying her 29th top 10 hit this week in 1998 was Madonna with the title track from her seventh album. "Ray Of Light" would go on to win two Grammy Awards (for Best Dance Recording and Best Short Form Music VIdeo), which was the first time she'd received a Grammy for one of her songs, having won previously for Blond Ambition World Tour Live (Best Long Form Music Video in 1992). Proving "Torn" had been no one-off, the ex-Neighbours star solidfied her musician cred by performing not only an original song, but one she co-wrote. The success of "Big Mistake" helped push the Left Of The Middle album into the top 10 for the first time and eventually to number 1 in August. A seven-week number 1 in March and April, "Never Ever" was All Saints' first hit in Australia - a vast improvement on the number 67 peak of debut release "I Know Where It's At". That earlier single would do better second time around, eventually reaching number 12. Twenty years and several hiatuses later, All Saints are stil going, with a new album due in July. While All Saints offered a cool alternative in the girl group market, Spice Girls continued their pure pop streak with their fifth top 10 hit, "Stop". In the UK, the Spice World track was the only one of their 10 singles released between 1996 and 2000 not to reach number 1 in the UK, blocked from the top by the Run-DMC remix. Double A-sides were huge in 1998, accounting for three of the year's 10 highest-selling singles. In some cases, a previous single was deleted and whacked on the follow-up as added incentive; in others, two previous flops were repackaged together. But in cases like this breakthrough hit for Aussie rock The Living End, it was a genuine single that boasted two lead tracks. Although it didn't get higher than this number 4 position, the double header lasted 47 weeks in the top 50 and ended up as 1998's number 6 single overall. Our final three entries are all chart-toppers, starting with the only Australian number 1 for country crossover star Shania Twain. Ballad "You're Still The One" fell from the top spot this week, where it had spent four weeks ruling the roost (possibly helped by the appearance of 1996's top 5 entry "(If You're Not In It For Love) I'm Outta Here!" as a bonus track). Shania would come close to number 1 on two more occasions, ultimately falling just short. Spending a second week at number 2 this week was another big ballad, "All My Life" by brothers Cedric and Joel Hailey. Far outperforming their only hit in their guise as members of Jodeci ("Freek'n You" reached number 23 in 1995), the R&B anthem would claim the top spot in seven days' time. If you have a look at my personal year-end chart for 1998, you can't help but notice I was quite taken by Steps in 1998. (And in subsequent years. And last year, when they put out a new album.) But it wasn't love at first listen. I was not a fan of this line-dancing hit, which became the highest-selling single in the UK not to reach the top 10. The cheesy novelty was embraced whole-heartedly in Australia, and although it only spent one week at number 1, it was deleted and added as a bonus track on follow-up "Last Thing On My Mind", which stormed into the ARIA chart at the end of June on its way into the top 5. The five-piece had been put together Spice Girls-style, with the project adverstised in The Stage magazine, following which auditions for pop star wannabes were held. Were it not for the early involvement of Pete Waterman, Steps may well have gone down in music history as a one-hit wonder or kept flogging the country-meets-dance gimmick. Instead, they moved on from "5,6,7,8" to their "ABBA on speed" sound and became one of the UK's most successful pop acts of the late '90s and early 2000s. In Australia, they had a couple more top 10 hits and a few more minor ones before the general public lost interest. 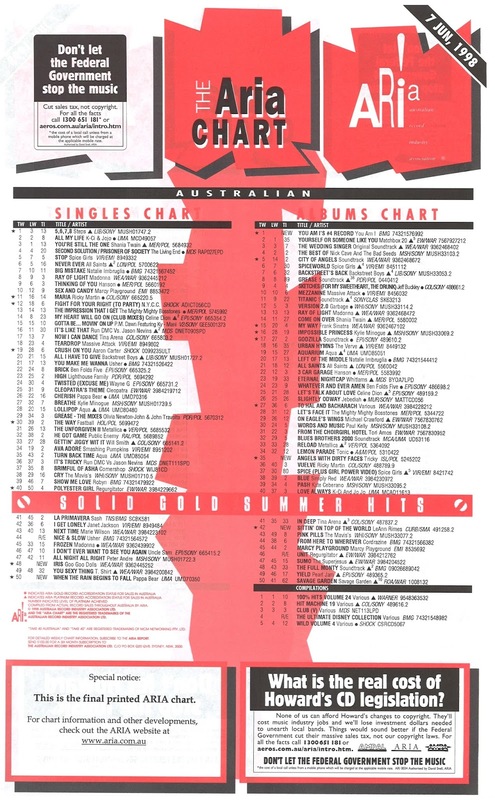 We continue our journey through the ARIA charts from 1993 next Wednesday. Join me then! I'm not sure that the music video had anything to do with 'Twisted''s success. While it was mentioned at the time on Sarch's long-defunct ARIA top 100 email list (does anyone reading this remember that? ), I never saw the video until looking it up on YouTube about 10 years ago. rage never aired it at the time; I suggested it for a Mardi Gras special a few years ago, which lead to them finally airing it. I'm surprised YouTube haven't blocked it, actually, given it's rather 'naughty' in parts. This chart is really a mixed bag for me. There are several songs I love (The Impression That I Get, Teardrop), some catchy guilty pleasures (5, 6, 7, 8; Crush On You, All I Have To Give), and some trash. The chart is actually not as bad as I thought it might have been from this period. I certainly couldn't find this many songs in the current top 50 I liked.